Whatever you think of his films, Steven Soderbergh keeps Hollywood lively. Anybody who can remake both Solaris and Ocean’s Eleven has to attract your attention. He’s created at least three films I admire: Out of Sight (brilliant effort at a novelistic structure onscreen); The Limey (but I wish it were longer); and The Underneath (underrated, especially by its director). So when Brian Rose and Paul Ramaeker sent me “You Can Make ‘Em Like They Used to,” by the ever-reliable Dave Kehr, I had to offer my two cents. You may want to check it before it evaporates into the Times pay-for-access archive. In a nutshell, Soderbergh’s The Good German is the most thoroughgoing effort by an American director to reproduce the look and feel of a 1940s movie. For me, Dave’s piece raises a lot of intriguing questions about how accurately you can reproduce an earlier style today. During the production Mr. Soderbergh was committed to remaining as true as possible to the technique of the era. By reproducing the conditions of an actual studio shoot from the late 1940s, he hoped to enter the mind of a filmmaker like Mr. [Michael] Curtiz, to explore the strengths and limitations of a classical style that has now largely been lost. This project hooks up with some arguments I made in The Way Hollywood Tells It. For one thing, I suggested that the overall “classical” style of Hollywood, founded on a certain conception of cinematic storytelling that emerged around 1917, hasn’t been abandoned, even in the most craven items we find in our multiplexes. But of course more local changes in style, shifts in particular technical devices of camerawork or lighting or editing, have come and gone. Another book I worked on, with Janet Staiger and Kristin Thompson, The Classical Hollywood Cinema, tries to trace some of the stylistic variations within the classical tradition. We covered topics like the development of deep-focus cinematography in the 1940s–just the sort of period-based technical choices that Soderbergh is trying to recapture. Another theme of The Way is interestingly confirmed by Dave’s article. Some historians have argued that we’ve entered a “post-classical” era in which classical storytelling principles have been abandoned. I tried to show that in fact many of our filmmakers, like Cameron Crowe and Martin Scorsese, have the utmost admiration for the studio filmmaking tradition and define themselves as heirs and continuers of it. 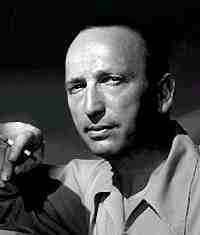 Spielberg said that he’d like to be the Victor Fleming of our era; now Soderbergh has a new model. Today most directors carry forward the basic premises of the overall classical style quite spontaneously. A few do so in fuller awareness of that tradition, and several of those think about how they can enlarge, deepen, vary, or otherwise add to the heritage that they respect. Evidently The Good German is an example of this last tendency. Take a deep breath. Some gearhead stuff coming. But interesting gearhead stuff. Wide-angle lenses have short focal lengths. As the name implies, they take in a wider field of view than lenses of longer focal lengths. They tend to distort vertical lines and make faces look puffy, so they weren’t recommended for medium-shots or close-ups. That was a task for lenses of “normal” lengths. It’s an interesting fact of film history, though, that over time the conception of a normal lens has changed. These lenses allowed directors to stage in greater depth, pushing foreground planes quite close to the camera and distant planes quite far back. And all the scene’s components could be in reasonable focus. 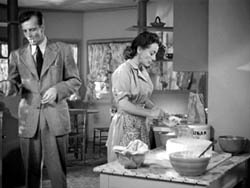 After Citizen Kane, The Little Foxes, Ball of Fire, The Maltese Falcon, and How Green Was My Valley (all 1941) showcased a range of deep-focus possibilities, many cinematographers developed wide-angle styles. They believed that the greater depth of field enhanced both realism and pictorial beauty. 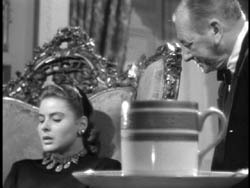 Russell Metty: Used 30mm lens at f/2.3 throughout Arch of Triumph (1948). (Herb A. Lightman, “‘Triumph’ in Low Key,” American Cinematographer 28, 5 (May 19447), 167. 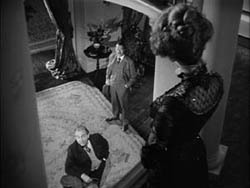 Here are some typical examples of late 1940s wide-angle shooting from The Little Foxes, 1941; Notorious, 1946; Caught, 1949, and T-Men , 1949. 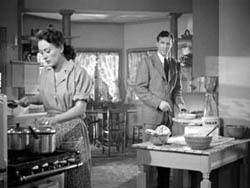 So given Soderbergh’s use of wide-angle lenses, will he try to reproduce the deep-focus look of the 1940s? Coda for Ultimate Gearheads: The 32mm lens to which Curtiz refers was presumably the Cooke Speed Panchro lens, since I can’t find any other 32mm lens available at the time. (See Jackson J. Rose, American Cinematographer Hand Book and Reference Guide, 4th ed., American Society of Cinematographers, 1942, pp. 44-45.) Most cinematographers used the wide-angle lenses available from other companies, which were typically in the 25mm, 30mm, and 35mm ranges. Cooke, Leitz, and other firms also offered a 28mm length and a few still wider ones (25mm, 24mm, down to the Goerz 15mm!). Another coda: The wide-angle style persisted in black-and-white filming into the 1950s and through the 1960s. It was hard to adapt to color in the 1950s, especially in the anamorphic formats like CinemaScope, but the emergence of faster color stocks made it more feasible in the 1970s. (I was reminded of this when Turner Classic Movies recently ran The Outfit (1973), with lots of neat depth shots.) The wide-angle look is occasionally revived today, notably in neo-noir, as here in The Usual Suspects. They also used only incandescent lights, Mr. Soderbergh said. Today’s actors aren’t accustomed to the blinding levels of set lighting of that period. So again, it’ll be very interesting to see if Soderberg’s inkies can provide enough depth of field to generate the flashy deep-focus of shots from the 1940s. Where many, if not most, filmmakers use “body mikes” to capture the intimate whispers of dialogue, Mr. Soderbergh recorded his sound the old-fashioned way, through a boom microphone held just over the actors’ heads by a technician standing out of camera range. I like the prospect of this whole approach, but I suspect that if 1940s filmmakers could’ve used wireless body mikes to cut camera murmur, they would have. Maybe this is a case when anachronism is welcome? Dave Kehr and I have long been arguing against current filmmakers’ reliance on static staging and frantic cutting among close-ups. (Some readers took me to the woodshed on my criticism of The Departed on these grounds.) Dave and I enjoy the synthetic style of the mature sound cinema: long-take handling of actors crossing the frame and readjusting themselves in an integral space, punctuated by pointed closer views and that underrated workhorse, the spacious two-shot. For audiences the shorter lenses mean a wider field of vision, expanding the camera’s range beyond the tight close-ups and two-shots that define today’s television-influenced filmmaking. With the wider range, groups of three, four or more characters can appear together on screen, minimizing the need for cross-cutting, which creates a different kind of interaction among the actors and a more expressive sense of the fictional space they inhabit. Actually, the long lens can also create the sort of dynamic among bodies in space that we appreciate. A telephoto framing can show the interaction of several characters too. (Granted, they’re behaving in a curiously cardboardy-looking space.) We get this interaction in Altman’s 1970s films, but my favorite exponent is Hou Hsiao-hsien, who blocks his action as subtly in the distant long-lens views as classic directors did using more normal lenses. Movies seldom turn out looking the way that the makers promised beforehand. Even the 1940s classics I litanized above don’t completely fit the cinematographers’ descriptions. Judging by the trailer for The Good German, the steep low angles and over-the-shoulder framings echo The Third Man more than, say, Jacques Tourneur’s Berlin Express. And put aside all the fancy aggression of deep-focus. The big question is: Will Soderbergh dare to be simple as well? One production still seems promising. I hope that Soderbergh has recognized that his mentor provided plenty of full shots with room for performers to breathe and move around. 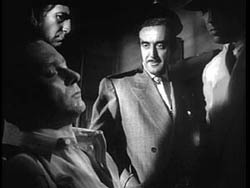 Such shots were as common, and as typical, in the 1940s as the suffocating compositions of noir. 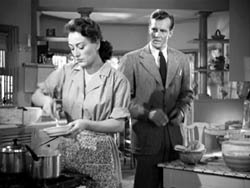 Recall this fluent passage from Mr. Curtiz’s noirish Mildred Pierce, in which characters cross the frame, shifting the compositional balance as the camera discreetly moves backward, inward, and sideways. 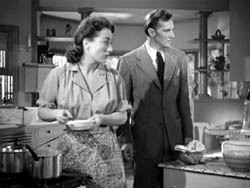 Mildred and her husband move unobtrusively forward as the dramatic pressure rises–before it’s cut off by a crucial phone call from offscreen. 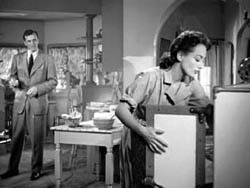 This staging technique is as characteristic of 1940s cinema as…well, as it is of 1930s and 1950s cinema. Let’s hope that some of it finds its way into The Good German. Can he really make ’em like they used to? I have more comments, especially on Soderbergh’s fascinating remarks on changes in editing, but those are more appropriate to my next installment. Owing to a slow and barren rollout, The Good German arrived in Madison last week. I caught it yesterday, so I thought I’d add this postscript. It’s hard to appreciate as a straight film, it’s so dense and tightly wrapped in an air of pastiche. For the first time in my life, I felt the way students starting to study film tell me they feel: Noticing technique takes away from following the story. 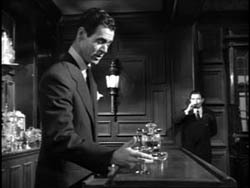 I found it hard to engage with the unfolding action because there was always some archaic technique obtruding–a trembling back-projection, a soft-edged wipe, or noirish lighting. I think audience involvement is also hurt by schematic plotting, with the Clooney character getting pretty regularly clobbered by bad guys. So what about it as a pastiche? I think it fails. It’s cut a bit fast for the period (I clock it averaging about seven seconds per shot), but that’s not the real problem. The photography is too high-contrast for a studio film of that period; on the print I saw, the blacks were fairly rich, but the whites were blasted out and the grays were mostly gone. The editing of the fights is very modern, short and sharp and at some moments almost unreadable. On the whole, shots are closer and compositions less compact than in the sort of 1940s film that Soderbergh seems to be mimicking. These factors are probably due to the fact that he had to shoot in 1.85 and couldn’t stick to the 1.33 proportions of the newsreel-montage credits. In my blog, I’d hoped that Soderbergh would revive the fluid crosswise staging of the period, but no such luck. Stand-and-deliver rules, with the over-the-shoulder framings and big reaction shots as prominent as in any movie today. Soderbergh also succumbs to the modern habit of ending a scene on a long-shot, which most directors of the time wouldn’t favor. As for the voice-over narration. 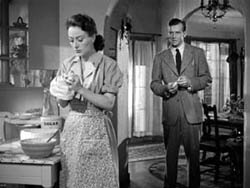 Soderbergh knows that the forties saw a lot of experimentation with this technique. But I don’t recall that his variant–each of the three main characters gets a stretch of voice-over in the beginning, middle, and end–has an equivalent at the time. When a 1940s film draws on more than one character’s voice-over, we’re given an overarching narrating situation to frame each one, such as the police interrogation of several witnesses, or the day’s boat trip of Letter to Three Wives. Here, the voice-overs aren’t framed in that way, so the result is more like the free-floating musings we get in The Thin Red Line or a Wong Kar-wai film. There are some nice trouvailles, though. The lighting in the sewer scene is purty, and it was a clever idea to use an abandoned movie theatre for a rendezvous, though the geography of the space isn’t really exploited much. I enjoyed the transition from the credits’ 1.33 format (complete with dirty projector gate) to the 1.85 one: the first shot in 1.85 is a darkened airplane hanger whose open doorway approximates the squarer ratio. On the whole, though, The Good German seems to me even more dry and cerebral a project than Solaris, a sort of film-school exercise by the deepest-pocketed kid in the class. Fortunately, the Oceans 11 franchise pays for it, but I wish Soderbergh would go back to the less showy genre riffs of The Underneath and Out of Sight. This entry was posted on Sunday | November 12, 2006 at 4:38 pm	and is filed under Directors: Soderbergh, FILM ART (the book), Film technique, Hollywood: Artistic traditions. Responses are currently closed, but you can trackback from your own site.